We get it – people do not want to spend money on “necessities”. It is so much more fun to just go out and buy things you actually want, not things that are simply needs. Which is why we look for different ways to save up money on various services as well. Moving is no different. A lot of us think of it as something that may even be overpriced for what it is. So we look for certain ways to handle it by ourselves, or at least to save as much as possible in any way. Well, as a Chicago moving company, you know that we will have an opinion on it. But it may not be what you think! Today we will give you actual ways to save up money on your move. Let’s start! The easiest way to save money on moving is to just handle packing the things by yourself. However, this is easier said than done. In fact, most people hire movers precisely because they hate packing. It also the most time-consuming aspect of moving. And if you do not know how to handle it properly, you may end up breaking things. Yes, truth be told, most people only consider themselves to be capable of good packing… But aren’t, really. So don’t fall for that thinking, and if you want to handle it by yourself, do some research online on the best packing practices. It probably won’t be a surprise for you when we say that most moves happen during weekends. That is the time when people are usually free. But weekend moves also cost more, due to the fact that they are often outside working hours. And the demand is higher as well, especially during warmer months. So if you want to save some money, you will be better off scheduling your move during a weekday. Of course, that means that you will have to skip work and figure things around that as well, but if you can make it work, that is a good way to get a cheaper moving rate. There are a lot of things in most people’s homes that are completely pointless. Tons of magazines laying around, clothes that are no longer worn, books nobody reads. We get it, it is tough to give certain items up. But it is necessary, if you want to lower the cost of your move. This here is an advice that is doubly great, because not only will you get a lower quote by moving less things, but you will actually get some money out of selling unwanted stuff. One man’s trash is another man’s treasure, right? 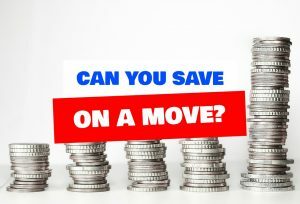 These are indeed three great ways to save up during your move. They are awesome, because you can take action on each of them, especially the first and the last. So go ahead and have a nice move!